Norwegian prog rockers Magic Pie have released a promo video for brand new song P&C, which you can watch below. The video was directed by guitarist Kim Stenberg, who shot the video on an iPhone. "P&C (pleasure and consequences) is a modern prog-metal approach from Kim," singer Eirikur Hauksson tells Prog. "In the choruses we stay true to the more kinda typical melodic Magic Pie stuff, but the verses are more in your face than we may have been known for previously. "I totally connected with this 'split-up' track, and lyric-wise it found me speculating as to why all the fun things in life, almost certainly lead to consequences. Well, 'my guy" goes through the whole ritual, starting in denial, building defences - but in the end his stray-cat era claims its toll. And there he is, like the most of us... Floating with the stream. Come to think of it - building a wall seems to be a popular subject these days." Magic Pie will be appearing at this year's Cruise To The Edge between February 4-9. 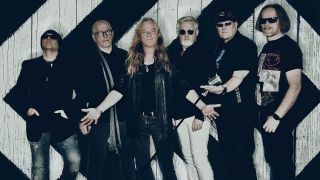 The band are in the final stages of mixing and mastering a new album at prog-maestro Rich Mouser’s studio in Los Angeles, and will be out on Karisma Records before summer.